Like most episodic games, Beyond Reasonable Doom does not require you to own either of the previous installments. The story is well encapsulated, and the application does a fine job of bringing you up to speed quickly and concisely. It does its best, however, to avoid spoiling earlier surprises, so if you decide you like it, you may want to stop there, and then start at the beginning. The puzzles, twists and turns in the earlier episodes are worth it. All Badge of Courage episodes are available as an iPad , iPod touch and iPhone app , but we recommend that you go with the biggest screen size available. As an iPhone app , it’s still much fun, but the screen crowds quickly whenever there are subtitles or the panel is complex, both of which occur frequently. In addition, some of the objects that you have to find and then click become a chore on the smaller screens, which is an issue with this genre in general. Hector: Badge of Courage, and Episode 3: Beyond Reasonable Doom in particular, is not a game for the easily offended. The dialog is often lewd and crude, and the subject matter often pushes the envelope. 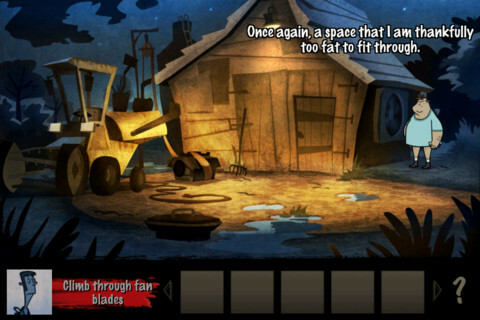 Many point-and-click adventures serve a dual purpose; they are fun and educational. This is not that application , and it is not well suited to young children. However, if the worst of South Park doesn’t offend you, it’s a lot of good edgy fun. An area where Beyond Reasonable Doom really shines is in the audio. The voice acting is comparable with high-end games, which is quite unusual at this price point. The quality of the acting and the comedic timing of the actors is what make this app as funny and engaging as it is. Disabling subtitles will save quite a bit of screen space, but the audio is currently only available in English, so non-English speakers have no choice but to you use subtitles. Finally, the graphics, which use a cartoony style, are quite good, and the animations are fluid. On all supported platforms, the responsiveness is excellent, so as long as you can see your target, it never feels like the app is fighting you, the way some point-and-click games do. In terms of value, Episode 3 is good but not great. It costs $4.99, but experienced gamers will knock it out in five hours or so. Fortunately, production values are quite high. AppSafari review of HECTOR: Ep3 – Beyond Reasonable Doom was written by Darius Reimm on September 27th, 2011 and categorized under Adventure, App Store, Fun, Games, Puzzler. Page viewed 6181 times, 3 so far today. Need help on using these apps? Please read the Help Page.